Abstracts: Shows the first 200-500 characters of the content, defined by the Abstract Length field. Table: Displays the content in an HTML table which can be styled by a theme developer. Title List: The content’s title as defined by the user who entered it. Full Content: The entire content of the entry. Asset Link Behavior: The default value is Show Full Content. With this value selected, when the link to an asset is clicked, the full asset is displayed in the current Asset Publisher. If the value View in a Specific Portlet is selected, clicking on an asset causes that asset to be displayed in the portlet to which the asset belongs. For example, a blog entry would be displayed in the Blogs portlet where it was created. Likewise, a forum post would be displayed in the Message Boards porlet where it was created. Similarly, a generic Web Content instance would be displayed in the Asset Publisher of its configurated Display Page. See the secton below on Display Pages for more information. Maximum Items to Display: You can display 1-100 items. Pagination Type: Select Simple or Regular. Simple shows previous and next navigation; regular includes a way of selecting the page to which you’d like to navigate. Exclude Assets with 0 Views: If an asset has not been viewed, exclude it from the list. Show Available Locales: Since content can be localized, you can have different versions of it based on locale. This will show the locales available, enabling the user to view the content in the language of his or her choice. Enable Conversion To: If you have enabled Liferay Portal’s OpenOffice.org integration, you can allow your users to convert the content to one of several formats, including PDF. Below these options are the same ones in the Web Content Display portlet: enable print, enable comments, enable ratings, etc. 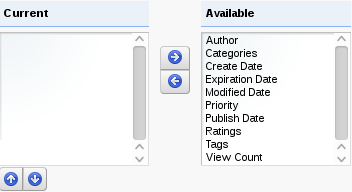 Show Metadata: Allows you to select from the available metadata types (see below). Enable RSS Subscription: This lets users subscribe to the content via RSS Feeds. The Display Settings section of the Asset Publisher has numerous options to help you configure how your content selections are displayed to your users. Even though there are many choices, it’s easy to go through the options and quickly adjust the ones that apply to you. You’ll want to use the Asset Publisher to query for mixed assets in the portal that have relevant information for your users. 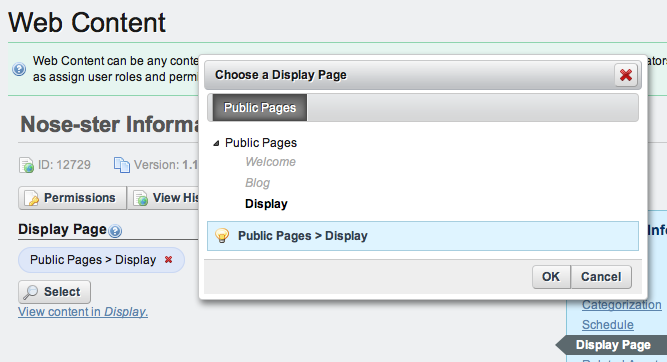 Next, we’ll look at Display Pages, an addition to the asset framework introduced by Liferay 6.1. If you’ve been using Liferay for a while, or you’ve just spent a little bit of time with this guide, you might have noticed something about how Liferay handles web content–content is never tied directly to a page. While this can be useful (because it means that you don’t have to recreate content if you want to display the same thing on multiple pages), it also means that you don’t have a static URL for any web content, which is bad for search engine optimization. As an improvement, Liferay has introduced the concept of Display Pages and Canonical URLs. Each web content entry on the portal has a canonical URL, which is the official location of the content that is referenced any time the content is displayed. A Display Page can be any page with an asset publisher configured to display any content associated with the page. When adding or editing web content instances, you can select a Display Page, but only pages with a configured asset publisher are available for selection. To create a Display Page, you can create a page yourself, add an Asset Publisher portlet and configure it yourself. Alternatively, you can use the Content Display Page page template included with Liferay. If you’re creating a Display Page manually, once you’ve added an Asset Publisher portlet to the page, open its configuration window. Then check the Set as the Default Asset Publisher for This Page box. Also, for its display settings, set the Display Style to Abstracts and the Asset Link Behavior to View in a specific portlet. You may now be thinking, “Wait, you just told me that each Web Content item has its own URL, and that this is somehow related to pages where we display a whole bunch of content on the same page?” Yes. That’s exactly what I said. Just watch–create a display page called My Web Content Display Page somewhere on your portal, using the Content Display Page template. Now, on a different page, add a Web Content Display portlet. Click the Add Web Content button, enter a title and some content, click on Display Page at the right, and select the Display Page you just created. Then click Publish. In the Asset Publisher of the My Web Content Display Page, you can now click the Read More link to display the content. Notice that the canonical URL for content appears in your browser’s address bar. If you create your own custom display page, any additional portlets that you place on the page are displayed along with the content when you access it via the canonical URL. If you used the Content Display Page page template for your Display page, it not only features a configured Asset Publisher portlet but also a Tags Navigation, a Categories Navigation, and a Search portlet. These tools help users to quickly identify relevant content. Let’s move on to another new featured introduced by Liferay 6.1.